They're there for all of us - standing behind us, around us... those faceless, personality-less, often times nameless predecessors. We don't credit them with loving, laughing, crying... living their lives with the same joys, sorrows and stresses we live with today. If we're lucky, some of them are the wrinkled faces we visit in the nursing homes. If we're unlucky, they're the names carved into the stones we visit at the cemetery. 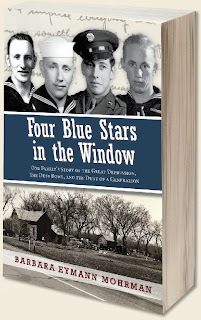 Barbara Eymann Mohrman brings her people to life in "Four Blue Stars in the Window", and we can all benefit from the knowledge that, even if we don't know our own story, it is much like this one. Our ancestors came from somewhere else, they settled in a harsh, inhospitable environment; they endured incredible hard times; they fell in love, married, had children; they made mistakes; they persevered. Four Blue Stars tells the story of Chriss Eymann as he was uprooted from his native Switzerland to settle in Oakdale, Nebraska. There he raised the all-American family - boys who loved baseball, hunting and basketball, girls who fell in love, married and gave him grandchildren. We see him and his bride, Hattie Mae as handsome, bright eyed newlyweds ready to settle down to a sedate, predictable married life. Then came the stock market crash, the dust bowl, the grasshopper plague and World War II. Their family faced the very real specter of starvation, and just when they had survived those hard times, their boys were sent off around the world to unheard of places to fight in a war Chriss couldn't understand. It is also the story of how a family kept the reverence for their ancestors alive. Family reunions, the visiting of the Oakdale cemetery each year on Memorial Day to care for and decorate the graves, picnics. All instilled in Mohrman the connection to her family and those who went before. Then she discovered the cardboard box in her basement that told her that her father had a life before he became the man she knew as dad. Her curiosity led her to dig deeper into her family history, and her education and writing skills led her to share her story with the world. 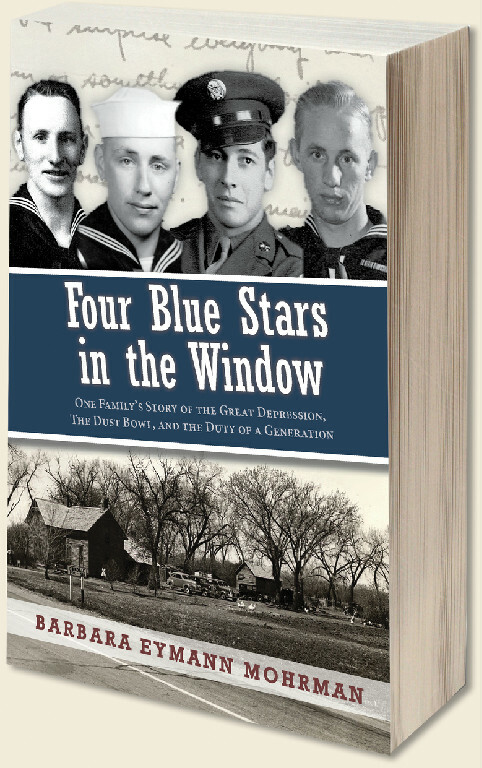 Four Blue Stars in the Window is an easy read, yet a poignant story of a family's life. It will be available on Amazon.com, on January 8, 2013, but can be found now at local Nebraska bookstores and from Mohrman's website.